This issue, we sit down with first-time author Omri Navot. In his coming-of-age novel Where Spirits Live, Navot tackles such issues as spirit animals, astral travel and reincarnation. Here, Navot discusses his novel, offers some advice for other self-publishers, and talks about his up-coming novel, The Fifth Immortal. Eternal Haunted Summer: How do you describe your spiritual path? Omri Navot: First of all, I would like to thank you for this interview and this opportunity to speak about Where Spirits Live. Now, to answer your question, I do not affiliate with any particular path or tradition. I was born into a very secular Jewish family and grew up with little or no religion in my life. As an adult, my natural spiritual inclinations led me to explore various traditions, so today my practice and beliefs are informed by various Pagan teachings (especially Wicca and Feri) and Buddhism. Spiritually, I am most concerned with expansion of consciousness and realization of the divine Godself. I am a non-dualist and a panentheist, and in addition I consider myself an Agnostic because it’s important to acknowledge that despite my faith and personal experience, I still don’t truly know anything. None of us do. EHS: Why did you decide to write Where Spirits Live? What inspired you to tell this story? ON: The story came to me rather suddenly and unexpectedly. I had just finished reading Many Lives, Many Masters, a book about hypnosis and past life regression. Shortly after that, I met an acquaintance who told me that she used to travel in the astral plane when she was little girl. The idea of a young child going on astral journeys not only fascinated me, but I also thought it would be a positive story to tell children to teach them about the expansiveness of reality. These ideas materialized rather clearly in the form of the character Itamar. As I wrote the story of Itamar from the point of view of one of his classmates, the narrator’s voice started to become more interesting than the character. That’s when I realized that the story would have more life if it was about a girl torn between this strange, mystical boy and her mundane life. Thus, Angela was born and this became a story not only about spirituality, but also about friendship, adolescence, and family. EHS: In the book, Itamar and Angela use meditative techniques to leave the Hard World and travel to the Soft World. Are these based on real techniques? If so, can anyone use them? ON: I am not an authority on astral travel and have no official training in psychology, religion, or meditation techniques, so please remember that this is only my personal take on this topic and should be taken with a grain of salt. That being said, the techniques and phenomena described in the book are loosely based on real world mysteries. I wanted to dramatize these real, documented phenomena by creating a unique mythology around them. Of course, certain elements of Angela and Itamar’s adventures (such as taking the forms of their spirit’s animals) are purely fictional. But the meditation techniques described in the book are based on extensive research of out-of-body experiences and past lives as well as my own personal experience with meditation. I encourage anyone who is interested in the topics brought up by Where Spirits Live to not only read up on out-of-body experiences, but also to explore the bounds of their own reality through meditation, chanting, dream work, or whatever methods are appealing to them. EHS: School officials and Angela’s parents do not react well when they learn that she has been soul traveling. Actually, they don’t believe the children did any such thing. Would you say their reaction is typical? How do you respond in turn to such reactions? ON: I do think their reaction is typical, unfortunately. Anyone who wishes to explore these topics is bound to come up against skeptics who will deny the “softness” of our world on philosophical, moral, or religious grounds. People are frightened to admit that the world doesn’t always fit into a nice, rational box and are comfortable to remain close to the world they know, which is the mundane. Often, the strongest objectors are those closest to us — our parents, siblings, children, and best friends — because those are the people who care about us the most. We need to remind skeptics that expansion of consciousness is beautiful, healthy, and integrating. We shouldn’t fear spiritual exploration of any kind. I must add that although these skeptical and defensive reactions are typical, they are not universal. There are people who are ready to embrace mysticism and support our spiritual exploration. Itamar’s mother, for example, fully accepts the wonder of her child and his soul journeys. EHS: Raven is an interesting character. Is she based on a real person or just a particular kind of person? ON: Raven, like all my characters, is not based a single individual, but on a mélange of characteristics and personality quirks. EHS: I don’t want to spoil the book for potential readers, but I need to ask: will there be more stories about Itamar and Angela? ON: I have had thoughts of where Angela and Itamar would go next, and there is certainly a lot of room for their journeys to continue, either together or as individuals. As it is now, I think Where Spirits Live stands on its own as a complete story. But if it gains enough popularity or (as some have suggested) is adapted as a movie and there’s enough demand, I would gladly revisit these characters and their world. EHS: What resources (books, email lists, teachers, et cetera) would you recommend to those interested in learning more about their spirit’s animal? ON: Some of the best books I have read on out-of-body experiences were the classic works of Edgar Cayce and Robert Bruce. Many Lives, Many Masters by Dr. Brian Weiss, which I mentioned earlier, is a great resource for skeptics or for people new to these topics. My favorite spiritual teacher is the incredible Alan Watts. The Alan Watts podcast and his books have been an important influence in my life. Also, I encourage people to do their own research and exploration. Do a web search, read a wikipedia page, follow links, meditate while hiking through the woods, listen to music that inspires you, go see art on a rainy day. There is sacred space all around us and every experience is a gateway to self-realization. 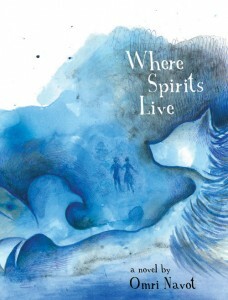 EHS: Where did you find the beautiful cover art for Where Spirits Live? ON: The cover art was painted by my wonderfully talented friend Yevgeniya Baras. I had an idea for what the cover might look like and she executed it more beautifully than I could have imagined. Please check her work. EHS: Where can readers find Where Spirits Live? ON: The book is now available on Amazon in paperback or Kindle editions. EHS: Since you self-published Where Spirits Live, what advice can you offer other authors? Things they absolutely should do? Mistakes to avoid if they can help it? ON: Before I self-published, I read this very helpful article so instead of passing this advice off as my own, I will link you directly to it. To authors who are looking into self-publishing, I will add a few of my personal lessons. I did not use a print-on-demand solution because I wanted more control over my printing. I used the printing company called 48 Hour Books and was very pleased with their service and the final product. If you want your book to look professional, you must get an ISBN and you must take extra care to be sure that your cover is well-designed and your typography is appropriate. If you do not have any design experience, reach out to a friend who can help you or hire a designer. EHS: What can you tell us about your next book, The Fifth Immortal? ON: I am about halfway into writing The Fifth Immortal and very excited about it. Whereas my first novel was a small story about friendships and personal journeys, The Fifth Immortal has an epic scale. It’s a fantasy adventure novel about a teenage boy’s quest to save his homeland by searching for ancient legends. In the process of this search, he ends up learning just as much about his personal identity as he does about his nation. The journey itself changes course and changes objective throughout the book, and that’s what I’m really fascinated with. ON: In my day job, I’m an animator and creative director. Currently, I’m working for a company that creates iPad applications. We are doing some amazing cutting-edge publishing in the digital space that I’m very proud to be a part of. Besides that, I am developing some of my own ideas for mobile applications that will bring together my writing and animation work. This is the scope of my professional work at the moment, but I have several artistic hobbies that I dabble in, including sculpture, jewelry making, and music. Again, thank you for this interview and for including me in Eternal Haunted Summer.